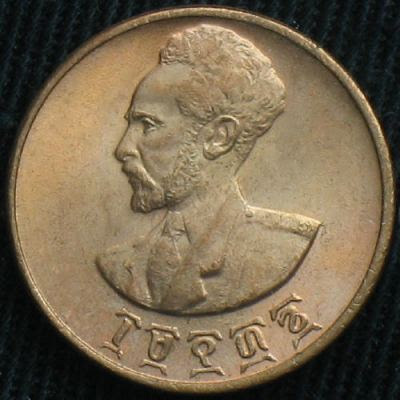 This topic presents a series of numismatic portraits of political leaders from sub-Saharan Africa, with brief accompanying details, mostly taken from Wikipedia. 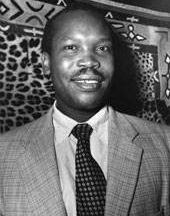 Sir Seretse Khama (1921 – 1980) was a statesman from Botswana. Born into one of the more powerful of the royal families of what was then the British Protectorate of Bechuanaland, and educated abroad in neighbouring South Africa and in the United Kingdom, he returned home to lead his country's independence movement. He founded the Botswana Democratic Party in 1962 and became Prime Minister in 1965. 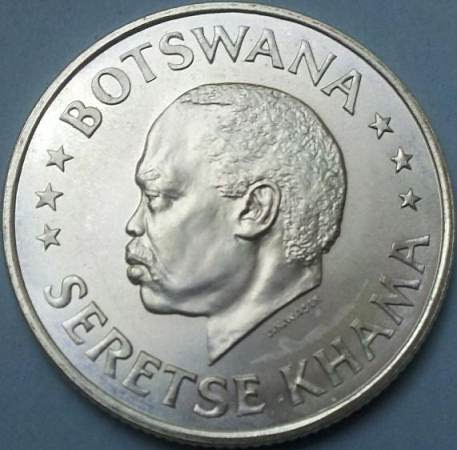 In 1966, Botswana gained independence and Khama became its first president. Khama remained president until his death from pancreatic cancer in 1980, when he was succeeded by Vice President Quett Masire. 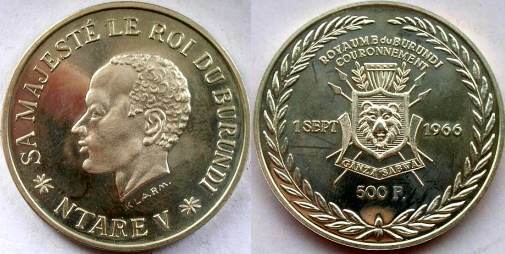 King Mwambutsa IV Bangiricenge (1912 - 1977) was the king of Burundi from 1915 to 1966. He was given the title of Mwami, or King. He succeeded Mutaga IV Mbikije. Like other Burundian kings, he was an ethnic Ganwa. 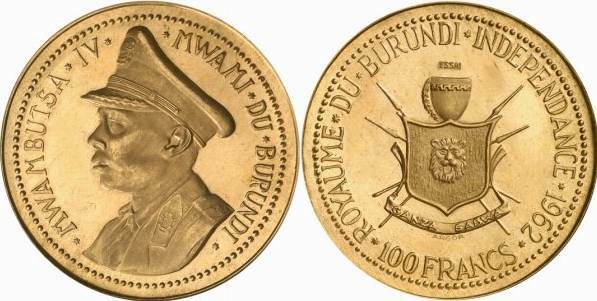 During the early part of his reign, Burundi was transferred from Germany to Belgium following World War I. He was the leader of Burundi when it was granted independence in 1962, and he created a constitutional monarchy, which suffered much turmoi,l including the assassinations of at least three prime ministers. He had to continue switching prime ministers to stay in favor with both Hutus and Tutsis. He was deposed by his son Ntare V in 1966 and fled to Switzerland, where he spent the rest of his life until he died in 1977. 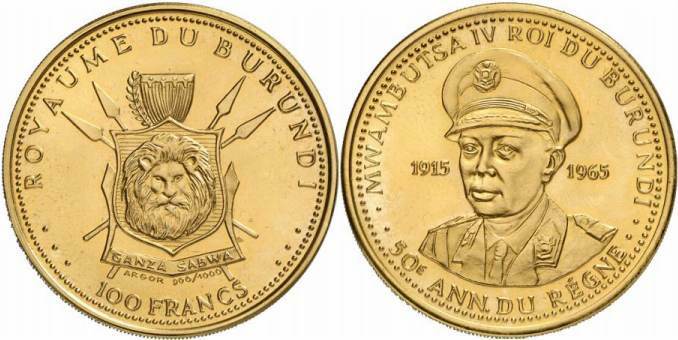 Ntare V of Burundi (1947 - 1972) was the king of Burundi from June to November 1966. 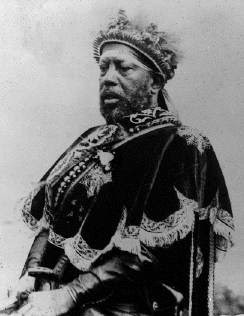 Until his accession, he was known as Crown Prince Charles Ndizeye. 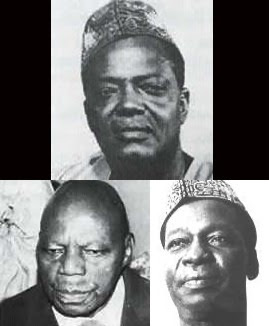 He deposed his father, Mwambutsa IV in 1966. 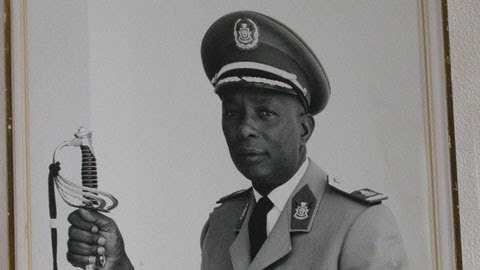 Ntare was himself deposed in a military coup led by Michel Micombero in 1966. The King went into exile in West Germany but returned to Burundi in April 1972. Soon afterwards the Hutus began an uprising against the government. On April 29, reportedly at the behest of President Micombero, Ntare was executed at the Ibwami royal palace in Gitega. The Hutu uprising was quelled by Micombero's forces. About 150,000 people, mostly Hutus, died in the ensuing inter-tribal fighting. 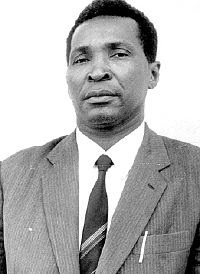 Michel Micombero (1940 – 1983) was the first President of Burundi from 1966 to 1976. He was an ethnic Tutsi. Micombero became Prime Minister on July 11 1966, and was the real power in the nation technically ruled by King Ntare V, who had deposed his father with the help of Micombero. On November 28, 1966, Micombero overthrew the monarchy and made himself president. He was overthrown in 1976 in a coup by Deputy Chief of Staff Jean-Baptiste Bagaza, a distant relative of Micombero from the same clan and political faction. Micombero went into exile in Somalia, where he died of a heart attack in 1983. 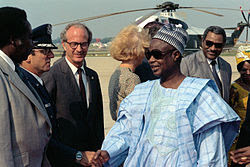 Ahmadou Ahidjo (1924-1989) was the president of the Federal Republic of Cameroon from 1960 until 1982. He resigned the presidency in November 1982 and handed over power to his prime minister and long-time associate, Paul Biya, but stayed on as head of the country's single political party. A power struggle broke out, however, and Ahidjo was accused of plotting against the government. He went into exile in France in August 1983 and in early 1984 was sentenced to death in absentia by a Cameroon court. Though the sentence was later commuted to an indefinite term of detention, Ahidjo never returned to Cameroon. He died of a heart attack on November 30th, 1989, in Dakar, Senegal. Jean-Bédel Bokassa (1921 – 1996), also known as Bokassa I of Central Africa and Salah Eddine Ahmed Bokassa, a military officer, was the head of state of the Central African Republic and its successor state, the Central African Empire, from his coup d'état on 1 January 1966 until 20 September 1979. Of this period, he served almost eleven years (1 January 1966–4 December 1976) as president (president for life in 1972–1976), and for almost three years he reigned as emperor (4 December 1976—20 September 1979). Although Bokassa was formally crowned in December 1977, his imperial title did not achieve worldwide diplomatic recognition. After his overthrow in 1979, Central Africa reverted to its former name and status as the Central African Republic, and the former Bokassa I went into exile. 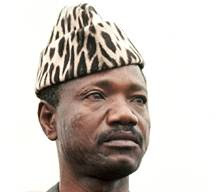 He returned to Central Africa in 1986, was put on trial for treason and murder and convicted of these offenses in 1987, and was imprisoned in 1987—1993. 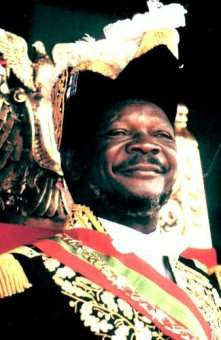 Bokassa lived in private life in his former capital, Bangui, until his death in November 1996. François Tombalbaye (1918 – 1975), was a teacher and trade union activist who served as the first president of Chad. Tombalbaye succeeded Gabriel Lisette as head of the Chadian Progressive Party (PPT), heading Chad's colonial government from 1959. He ruled the country during its independence on August 11, 1960, and was appointed its first head of government. On April 13, 1975, after some of the country's leading officers had been arrested for involvement in an alleged coup, a group of soldiers killed Tombalbaye and installed Félix Malloum, by then a general, as the new head of state. Joseph Kasa-Vubu (1910? – 1969) was the first President (1960–1965) of the Republic of the Congo, today called the Democratic Republic of the Congo. Kasa-Vubu was a leader of the ABAKO (Alliance des Bakongo) Movement of his own lower Congo River Bakongo people. Upon Congo's independence from Belgium, he was elected president by the Congo's new national assembly, taking office on June 30, 1960. The new republic was immediately disrupted by political and military strife and regional secessionist movements, while the central government was paralyzed by conflict between the conservative Kasa-Vubu and his nationalistic prime minister Patrice Lumumba. 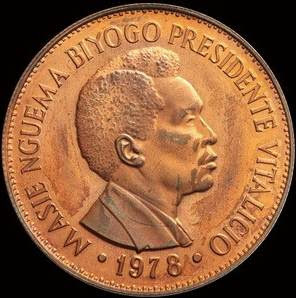 On September 5, Kasa-Vubu dismissed Lumumba but the prime minister refused to accept this and in turn announced Kasa-Vubu's dismissal, creating a stalemate that was only ended on September 14 with army commander Joseph Mobutu's seizure of power and arrest of Lumumba. Lumumba was later handed to secessionist forces in the southern province of Katanga and killed. Over the next five years, Kasa-Vubu presided over a succession of weak governments. In July 1964 he appointed former Katangan secessionist leader Moise Tshombe as prime minister and permitted the use of European mercenaries against leftist rebels. 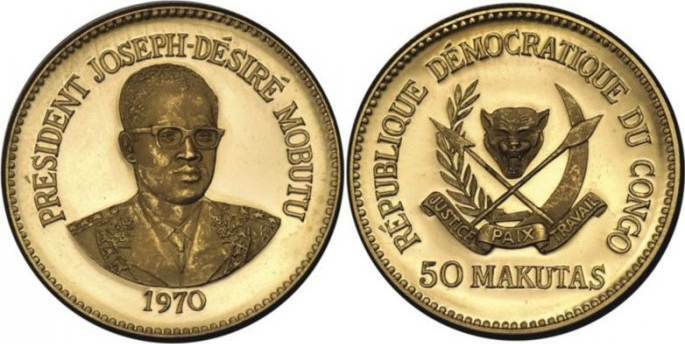 Mobutu seized power for a second time on November 25, 1965, this time deposing Kasa-Vubu and subsequently declaring himself head of state. Kasavubu then retired to his farm at Boma on the lower Congo River, where he died in 1969. Joseph Mobutu was president of the Republic of the Congo, the Democratic Republic of Congo, and Zaire - different names for the same country. 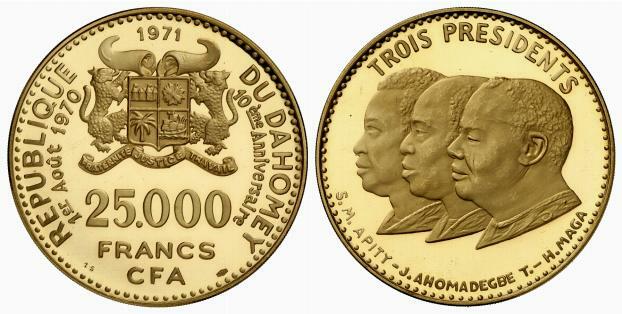 Sourou-Migan Apithy, Justin Ahomadégbé-Tomêtin, and Hubert Maga were members of the Presidential Council of the Republic of Dahomey (now Benin), from 1970 to 1972. 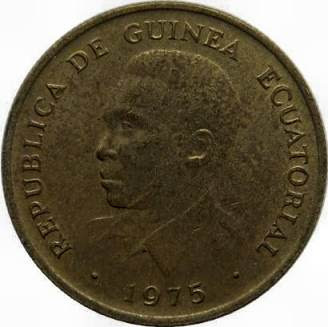 Formerly the colony of Spanish Guinea, Equatorial Guinea became independent on October 12, 1968. 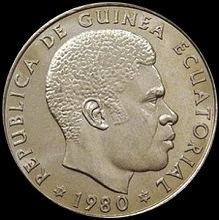 In September 1968, Francisco Macías Nguema had been elected first president of Equatorial Guinea, and in July 1970 he created a single-party state. Nguema’s reign of terror led to the death or exile of up to 1/3 of the country's population. Out of a population of 300,000, an estimated 80,000 were killed. Teodoro Obiang deposed Francisco Macías Nguema on August 3, 1979, in a bloody coup d'état. Nguema was sentenced to death and executed by firing squad. Teodoro Obiang remains the president of Equatorial Guinea. 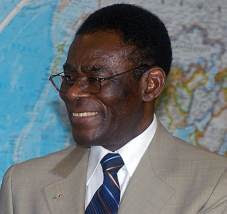 Teodoro Obiang Nguema Mbasogo, current president of Equatorial Guinea. 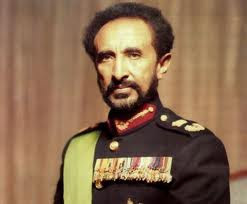 Haile Selassie I (1892-1975) was the last emperor of Ethiopia (1930-1936, 1941-1974 AD). He was overthrown in 1974 and died in prison in 1975.